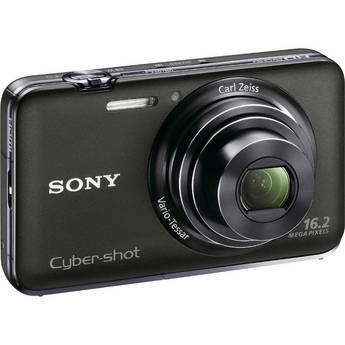 Sony Cyber-shot DSC-WX9 Digital Camera (Black) for $149. Expires 1/31. Sony's sleek little Cyber-shot DSC-WX9 Digital Camera (Black) isn't just another pretty face--a high-resolution 16.2MP CMOS sensor, Carl Zeiss 5x wide-angle 25-125mm (equivalent in 35mm format) lens, and full HD 1080/60i video make this a major-league player. A large, bright 3" 921K-dot high-resolution LCD monitor makes it a treat to compose and review your photos and videos. The DSC-WX9 has a full arsenal of cutting-edge features that let your creativity run free: a high resolution iSweep Panorama mode for automatically putting together an impressive, ultra wide-angle panorama photo (without using a tripod); backlight correction HDR for turning high contrast problem shots into beautiful images; Background Defocus to give your portraits that subject-in-sharp-focus, background-way-out-of-focus professional look; 3D and 3D Panorama; and Smile Shutter (snaps a picture when it detects a smile), Anti-blink (doesn't take a picture when eyes blinking are detected), and Soft Skin (reduces blemishes and wrinkles) for flattering pictures of friends and family. Plus, Optical SteadyShot image stabilization, Motion Detection and Anti-motion Blur mode banish blurry pictures forever. And with Superior Auto mode, the WX9 automatically detects 33 different situations and gives you the optimal settings for each situation--all you have to do is press the shutter button!